See below for a list of my talks and speaking engagements over the years. This not a complete list. I enjoy engaging with an audience or just having a discussion. I have also done many institutional presentations at Umeå University and elsewhere. During my tenure at HUMlab I presented the institution, digital humanities and related matters hundreds of times. Visiting delegations included the Board of the Wallenberg Foundation, several government ministers, the county governor, the Swedish Research Council (including the chair), Riksbankens Jubileumsfond (a major humanities-social sciences funding agency), the Swedish King and Queen, regional boards, international delegations from all over the world, CEOs of large companies, groups from Parliament and EU delegations. Such presentations are not included in the list below. Can there be a Nordic Digital Humanities? Från humaniora till informationsteknik: studiomiljöer, nya ämnen och humaniora.se. National professional development day for university librarians in the humanities, Umeå University. [From the humanities to information technology: studio environments, new disciplines and humaniora.se]. Är e-post redan på väg ut? [Cyberspace as a cultural laboratory and history]. Lecture for second-term history students. 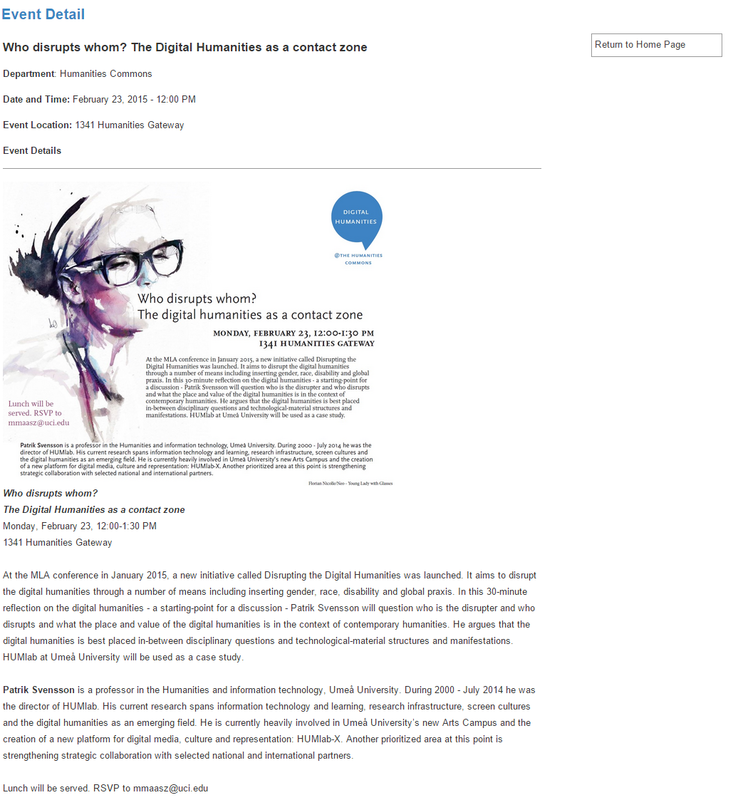 The Humanities and Information Technology: New disciplines or a new University? [From pens to text messages – technology, body and language]. 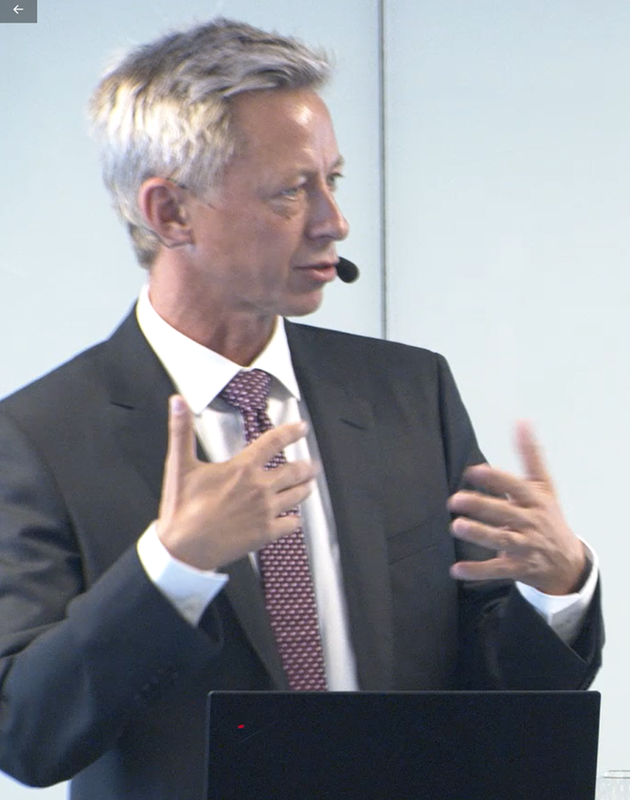 Prize lecture, Kungliga Skytteanska Samfamfundets pris. Seminar at CITU, Lund University. [The cultural laboratory: simulating, cooperating and exploring]. Presentation at Umeå Forum 2002. [New arenas for learning: virtual monsters, collaborative knowledge building and motivating media]. Workshop on representation for Nordisk musikpedagogisk utbildning. Piteå. The IATEFL conference 2001. Brighton, England. Språklärardagarna, Umeå University. Patrik Svensson and Pat Shrimpton. [Corpora in language teaching]. Umeå University. In-service training for school teachers. [New arenas for academic work]. Umeå University, Dept. of Literature and Scandinavian languages. Nya medier och möjligheter i akademisk språkundervisning; Vill vi vara virtuella? Akademisk språkundervisning och IT: Vill vi vara virtuella? [Academic language teaching: Do we want to be virtual?]. Seminar at Gothenburg University, Dept. of English. Den webbunderstödda kursen – erfarenheter, koncept och funderingar [Web-enhanced courses – experiences, concepts and thoughts]. HUMlab/CUT seminar. [IT in language teaching]. Paper presented at the national LMS conference (teachers of modern languages). [IT at a language department]. Seminar arranged by Centrum för utbildningsteknik. [Virtual weddings – an educational project for English studies based on the interactive environment Active Worlds]. Presentation at IT-forum in Skellefteå. Paper presented at the Ämneskonferens in Karlstad (national conference for university language teachers) together with Pat Shrimpton. Information technology in the Humanities. At the Centrum för studier av IT ur ett humanvetenskapligt perspektiv, Borås. Paper presented at KORFU 1999 at Växjö University. Together with Pat Shrimpton. Seminar arranged by CUT.